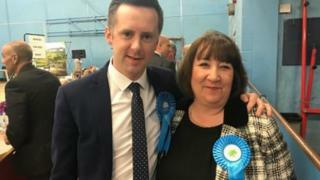 A former mayor who was suspended by the Conservatives for sharing a racist joke on Facebook has been reinstated - handing the party a council victory. Councillor Rosemary Carroll was forced to stand down for three months over the post which compared an Asian to a dog. Her re-admission allowed the Tories to gain control of Pendle Council in Lancashire by one seat, which has angered Labour. However, Tory leader Paul White said Ms Carroll had "learned form her mistake". He added: "Rosemary is a good councillor for Earby. A popular councillor. She made a mistake, people make mistakes." Labour leader Mohammmed Iqbal described the decision as "a damning indictment of the Conservatives". "She was welcomed back with open arms," he said. "They should have done the decent thing and distanced themselves from her. I'm appalled. The suspension was a gimmick." The Conservatives took narrow control of Pendle with 25 seats, ahead of Labour's 15 and the Liberal Democrats' nine. Ms Carroll continued to sit as an independent councillor after her three-month suspension expired last year. But Mr White confirmed she had rejoined the party "in the last few days", meaning her seat reverted back to the Conservatives. Defending the councillor, he said: "We can't be in this position in the world where people can't make mistakes. "She has apologised and done diversity training, and I am confident she has learned from her mistake." A Conservative Party spokesman said: "It was a local matter that was dealt with locally." There had been two formal complaints about the Facebook post, which Ms Carroll said she intended to delete but ended up publishing by mistake.